Highland Crossings’ townhomes that overlook Lake Windermere. 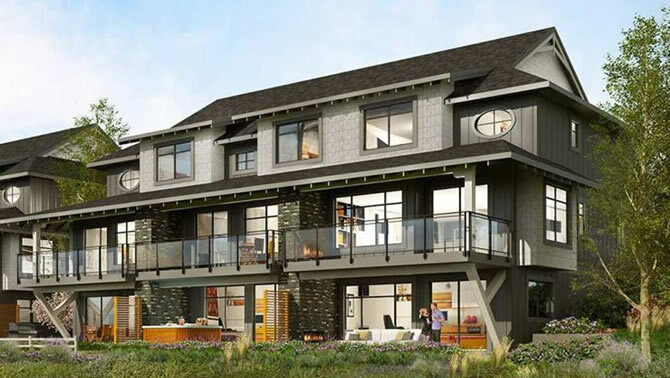 — Urban West Projects Inc.
Urban West Projects Inc. announced today the launch of Highland Crossing, a new $4.1 million residential townhome development at the foot of Main Street in Invermere. Perched on a hilltop for prime south-facing vistas and designed with pedestrian accessibility in mind, the multi-generational neighbourhood will feature seven townhomes at build-out. Inspired by Invermere’s small town heritage and natural surroundings, homes at Highland Crossing reflect the essence of the Town and lakeside location. Residents will enjoy spectacular views of Lake Windermere from spacious south-facing decks designed for outdoor living and entertaining. Glass deck railings and picture windows maximize views of the Purcell Mountains to the west and Rocky Mountains to the east. Urban West Projects has released the details of two three-bedroom floor plans sized at 1886 sq. ft. and 2132 sq. ft. Strategically designed with spacious interiors for modern living, residents will enjoy three levels of integrated indoor/outdoor living. All homes feature three and a half baths. Larger units are located on the building corners and maximize natural light, with three sides of exposure. Homes are priced from $550,000 and $620,000 respectively. Residents at Highland Crossing will enjoy convenient access to an array of essential amenities located in downtown Invermere. Within walking distance from the development there is a post office, banking, the hospital, public schools, a Community College, library and community centres. Residents can enjoy direct beach access to Windermere and Dorothy Lakes. There are eight championship golf courses located within a 30 minute drive. Featuring an elegant and timeless aesthetic, all homes employ ageing-in place principles. Designed for lock-and-leave convenience, homes feature low maintenance finishes and allow families to enjoy more time outdoors. A secured keyless garage offers a safe haven for vehicles and protects recreational toys from the elements. Upgrade options include elevators, hot tubs and exterior fireplaces. Highland Crossing is a significant indicator of the positive direction real estate is moving in the Kootenay region. According to the BCREA November 2015 Forecast (Source), housing demand will increase by nearly three per cent in 2016. The Kootenays is expected to see the same level of housing demand in 2016 as experienced in 2014. Highland Crossing is being developed by Urban West Projects Inc. Headquartered in Vancouver and founded in 2012, Urban West Projects has a history in identifying and developing multi-family infill sites in established neighborhoods. It currently has projects in Calgary and Vancouver. Burrowes Huggins Architects, who previously worked on Panorama Mountain Resort and the Whistler Four Seasons Hotel, will execute a vision that is architecturally harmonious with the surroundings. Award-winning Vancouver-based landscape architects PWL Partnership, known for its work on the 2010 Olympic Village in False Creek and the world’s largest green roof on the Vancouver Convention Centre, has been appointed to enhance the landscape. Construction is planned to begin in January 2016.